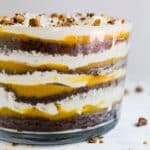 Kahlua Toffee Chocolate Trifle Recipe - a seriously delicious make-ahead dessert. 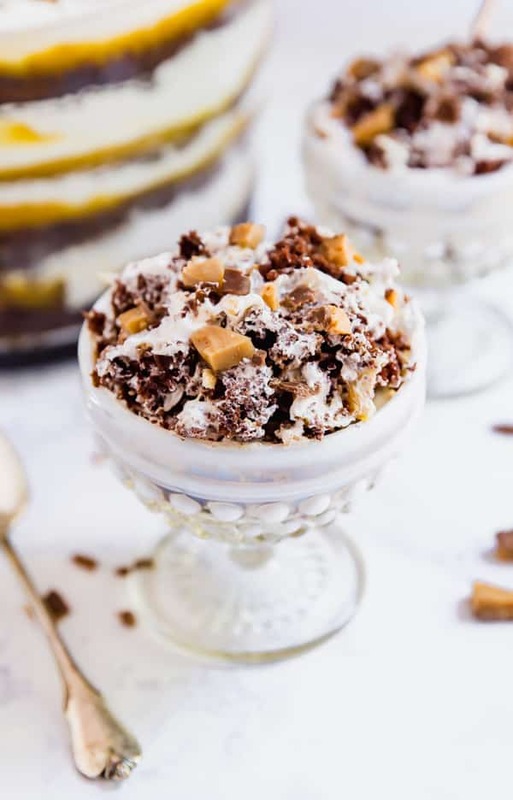 This Kahlua Toffee Chocolate Trifle Recipe is the ultimate make-ahead dessert. It’s also so addictive that your family will be fighting for seconds! Can I tell you a secret? I’ve never really liked Trifle. I feel like, for many people, this is probably the cardinal sin. You’re probably sitting there thinking, “how does she not like trifle? !” Hear me out. I think we can all agree that a large thing that can make or break someone’s feelings about various foods is texture. And that is pretty much the clincher for where I stand with trifle recipes. I’ve always found them to be sort of mushy, and it’s just not my thing. But then I tried my mother-in-law’s trifle recipe. And I’ll admit, I was a tiny bit skeptical. 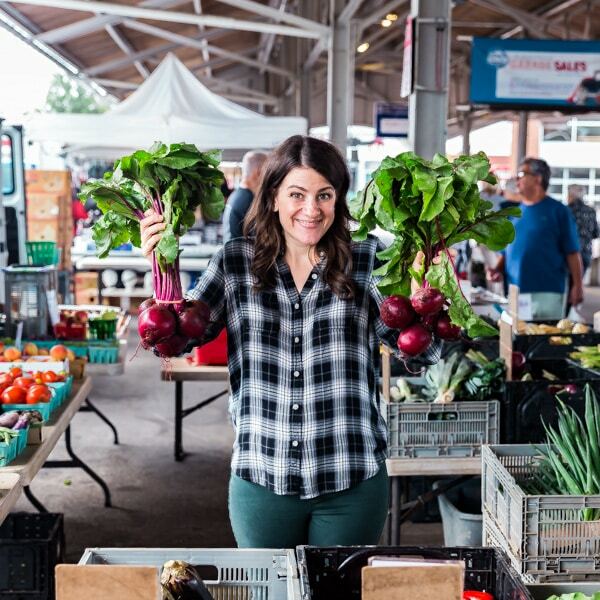 But only a tiny bit because everything that she makes is always seriously delicious! And this was definitely not an exception. I had two helpings that day! First and foremost, it didn’t get soggy the way many trifles tend to. I mean, it still had that comforting trifle texture but it was super enjoyable and the pieces of Skor bars added a nice crunch. 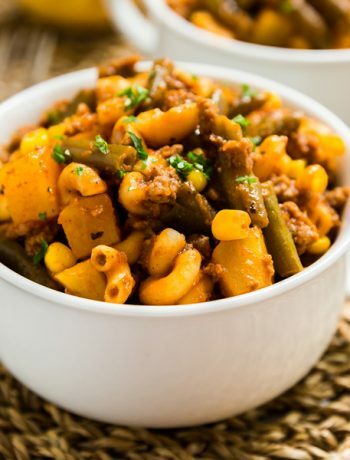 This also has a super delicious combination of flavors that taste even better together. 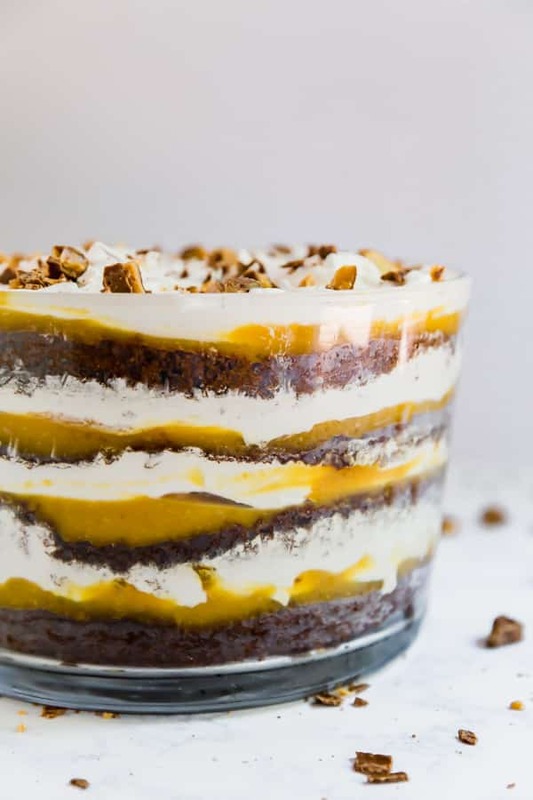 Think of it as a chocolate trifle with some serious upgrades. Vanilla pudding made with Kahlua becomes tasty, it’ll be difficult not to eat the entire bowl before you get around to assembling the trifle. 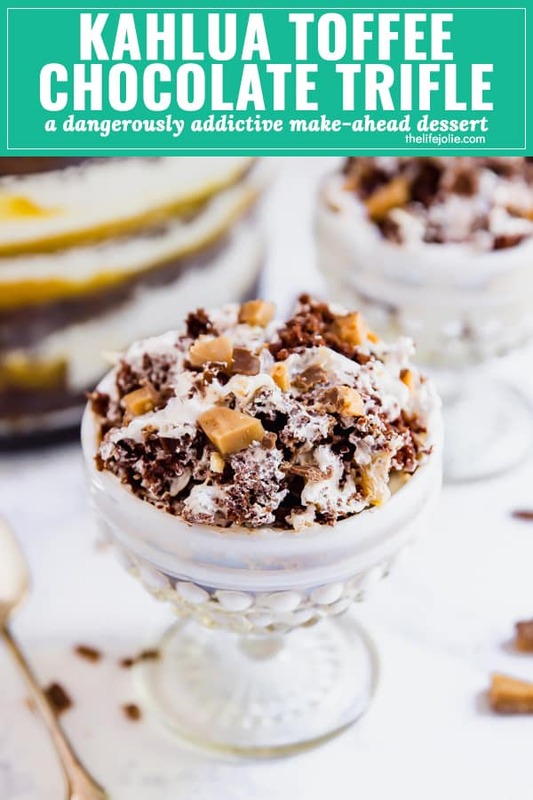 This mixed with creamy whipped topping, layers chocolate cake and those buttery and perfectly crispy toffee bits make a dessert that will have everyone fighting for seconds! 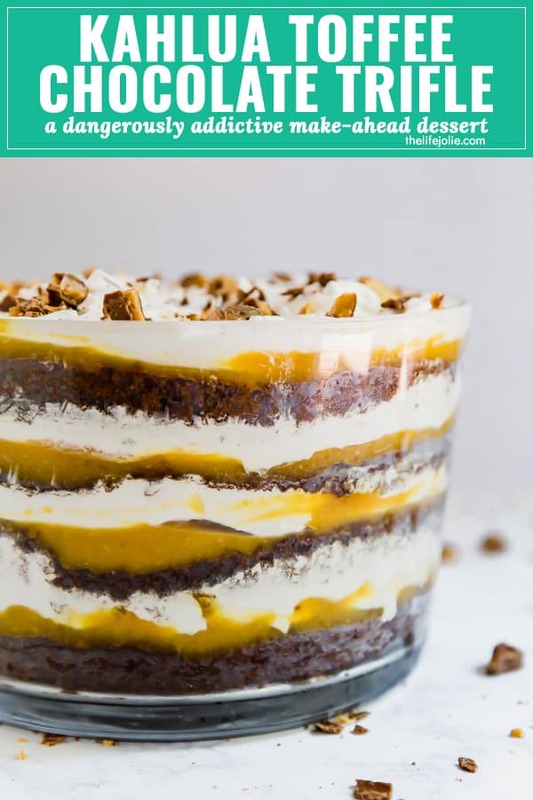 And best of all it’s a super easy trifle recipe, so there’s no stressing about dessert! 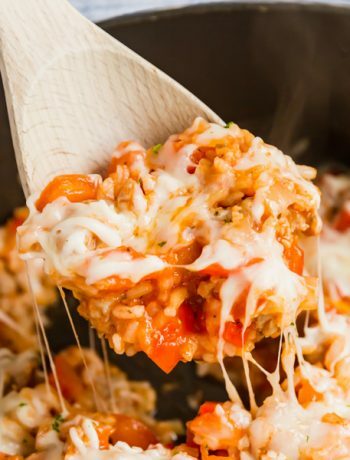 This is definitely a make ahead recipe so be sure to make it the night before because it gets better as it sits overnight. The original recipe calls for Skor bars but you can also use Heath Bars or any other brand of toffee chocolate bar. 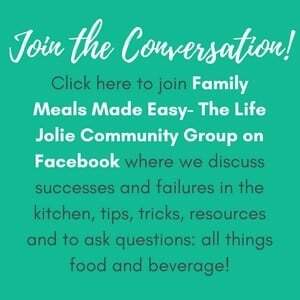 Although I strongly encourage you to use the Kahlua (it’s such a small amount per serving that I served it to my daughters without being concerned) but if you’re really set on not using any booze, you can probably substitute coffee for it. Be aware: I have not tested it with anything but Kahlua, so no guarantees, but I’d imagine it would be fine. Make sure it’s instant pudding that you get and not regular pudding which requires cooking. I used a trifle dish that is 8 inches in diameter but I’ve also made it in my really big one which is 9 inches in diameter. For that I baked the cakes in 9 inch pans and because it was a larger dish, it didn’t quite reach the top like this one did. That being said it did not affect the flavor at all, just the presentation. 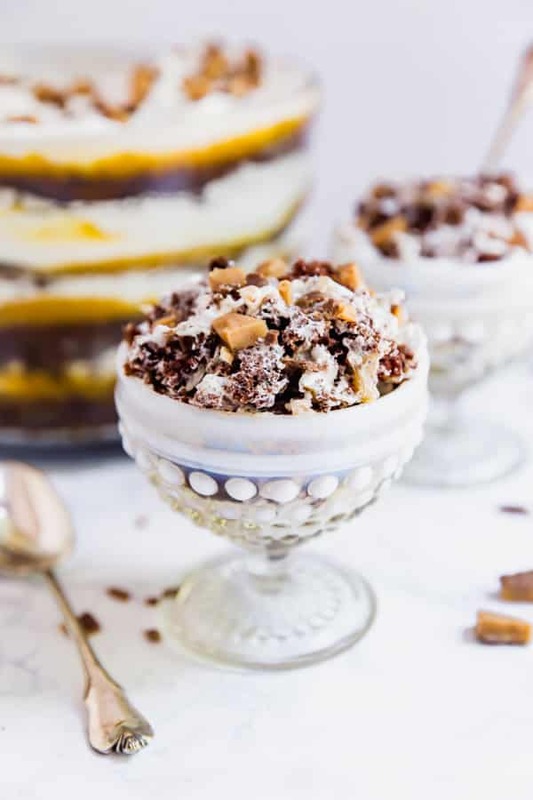 This Kahlua Toffee Chocolate Trifle Recipe is the ultimate make-ahead dessert. It's also so addictive that your family will be fighting for seconds! Bake the cake as directed on the packaging in two 8 inch round cake pans. Let the cakes cool completely and slice each hake in half so you have a total of 4 round layers. While the cakes cool, combine the pudding mix with milk and Kahlua. Refrigerate to thicken. 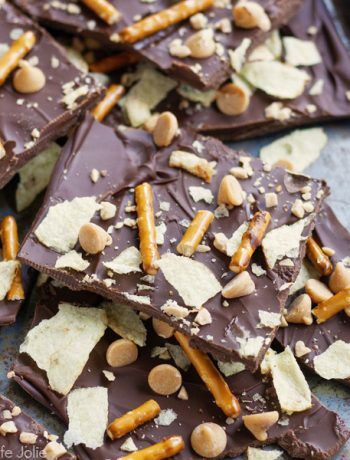 Break the toffee candy bars into small pieces with a meat mallet or rolling pin. Set aside. 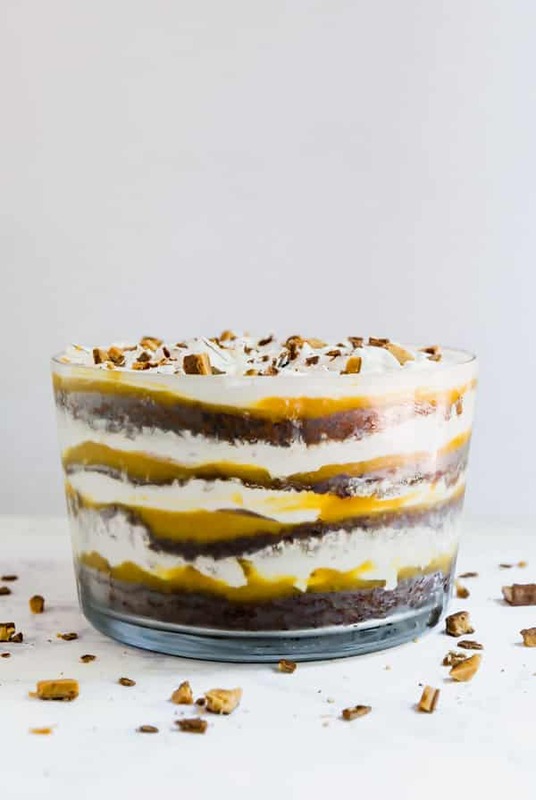 When you're ready to assemble, layer cake, pudding, whipped topping and toffee candy bar pieces until you've reached the top (you should have around 4 layers). Refrigerate overnight until you're ready to serve. This is best if you let it rest a full 24 hours. 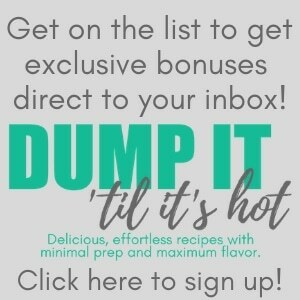 Looking for some other chocolate dessert recipes?